Enny Aregbe is very thankful. Dressed in a bright green Nigerian “up and down” outfit, with a lime-green manicure to match, Miliki’s co-owner could barely stop smiling as she watched over hungry brunchers at her restaurant last Sunday. Aregbe has much to smile about. Not long ago, it looked like Miliki would be closing its doors on MacArthur Boulevard to make way for a beer garden, run by the premise’s new landlord, Paul Schneider. But, after an unexpected turn of events, Schneider has agreed to let Miliki stay. The announcement is the latest switchback in Miliki’s changing fortunes. Co-owner Ismael Okunade previously told the Express that, after purchasing the building, Schneider seemed open to keeping Miliki on as a long-term tenant. But last October, a change of heart meant Miliki was asked to vacate the premises. Aregbe and Okunade began to look for a new building, in the hope that Miliki would not have to close permanently. But real estate in this city doesn’t come cheap, and Miliki’s chances didn’t look good. That’s when the local community rallied round the restaurant. An online petition gathered more than 1,100 signatures from Oaklanders in favor of keeping Miliki open in Laurel. There was talk of a fundraiser barbecue, a dance. “Pretty much nobody that I know of in this neighbourhood was supportive of them leaving,” Miliki neighbor Jason Wallach said. The owner of Laurel Cyclery, Wallach joined other local businesses by displaying “We Heart Miliki” banners in the window of his store. The banners drew attention from members of Oakland’s West African community, who were surprised at the level of support. “I think folks are really used to kind of feeling marginalized, and feeling in the shadows,” Wallach said. But after the banners appeared, a stream of well-wishers began to stop by the restaurant to show their support. The campaign to save Miliki, Wallach believes, “outed” the local community’s appreciation of the restaurant and its owners, as well as creating a conversation about the effects of gentrification in Laurel. 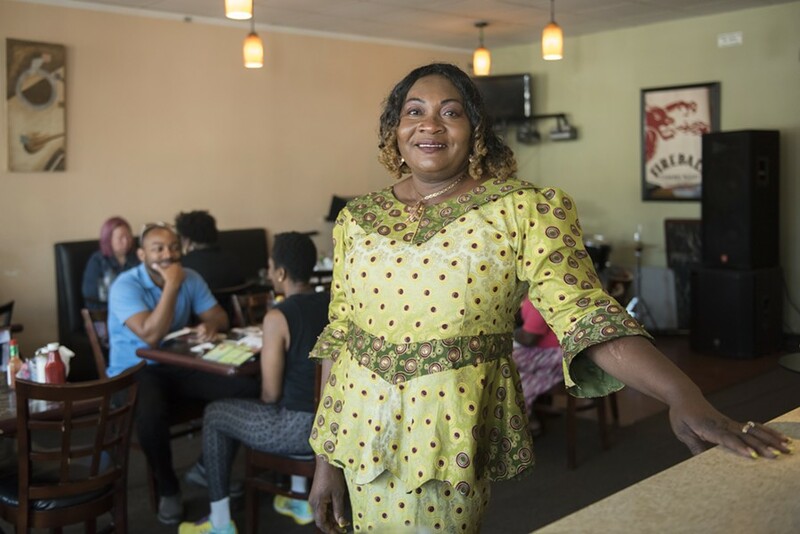 Since Miliki opened in 2010, it has become a focal point for Oakland’s West African community. The restaurant features traditional dishes with herbs and spices imported from Africa, but also serves as a gathering space, a home away from home. As Wallach pointed out, former Golden State Warriors star Festus Ezeli ate at Miliki after winning the championship. Miliki may not be gourmet, “but on the day he showed up, it was the meal of a champion,” Wallach said. Nonetheless, it looked like Miliki was set to close last year. Which is why Aregbe — and her patrons — were shocked when Schneider offered up a new lease. “Even up until now, we still get calls. A lot of people thought we left,” she said last Sunday. “I think some of the businesses need to get some of the same protections as people who are renters,” he said, particularly if those businesses have been in the community for a long time. For Aregbe, an end to the uncertainty means the chance to get back to business. She’s considering new menu ideas, and looking forward to greeting her patrons with the good news.